Workday: Historic Ships in Baltimore May 3, 2014 – Chesapeake Chapter U.S.L.H.S. 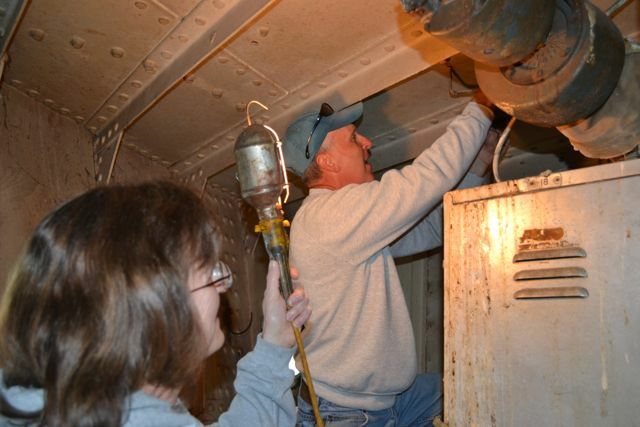 Donna and Jeff removed light fixtures from room forward of Anchor Windless room. A small crew showed up for a volunteer day up in Baltimore. There was a lot going on in the inner harbor and there were a lot of people out for a beautiful spring Saturday. We even saw a small parade when we were leaving for the day. Most of the work was dedicated to getting the electrical infrastructure of the ship back into shape. As you can imagine this takes you to all corners of the ship. A couple of volunteers made their way forward on the lower deck to an area that visitors don’t get to see. To get there you must go thru the anchor windlass room that contains the machinery that raises and lowers the 5000-pound anchor and then climb a ladder to get to the little area in front of that. 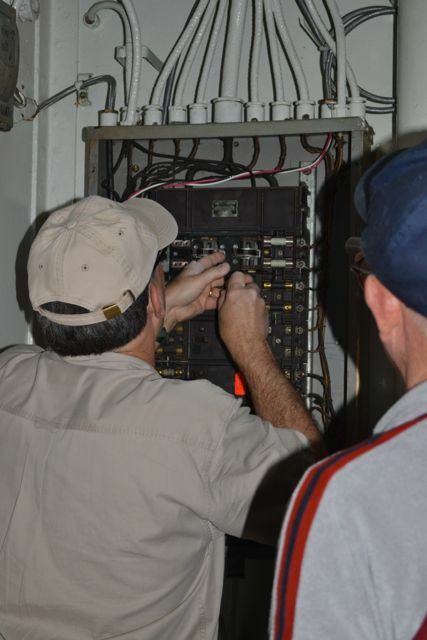 Once there the light fixtures were removed from what I believe is called the Bos’n locker in preparation for rewiring. The fixtures will be cleaned and given a fresh coat of paint before being returned. 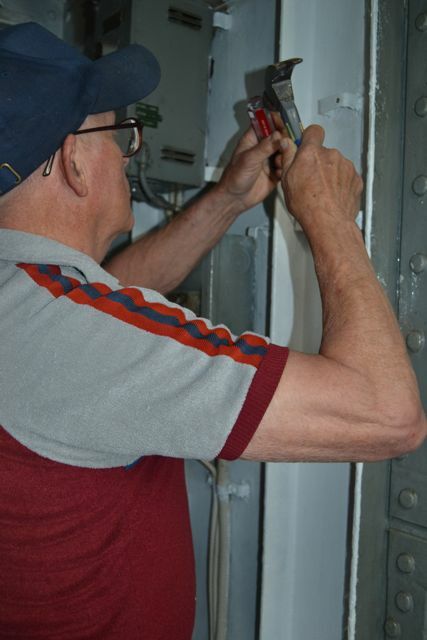 In another area we have become more familiar with in recent work days (the engine room upper Fidley) the electrical fixtures were cleaned and painted. 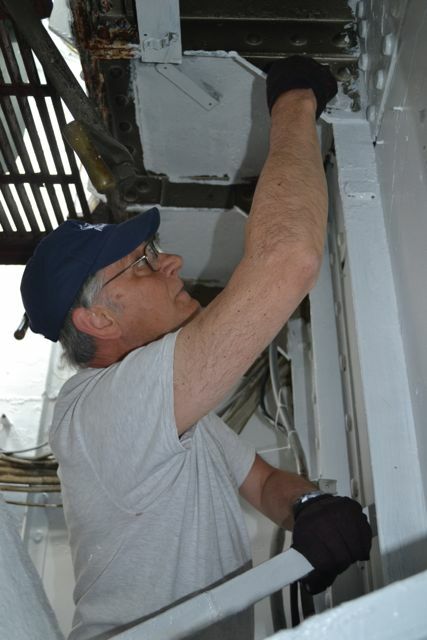 Then back in the windlass room some new wire was strung and some of the repaired light brackets for a junction box and a plug were mounted. Many of the threads for the lighting brackets were cleaned out so when the wiring is put back in place they be in good shape. There was other work done – an old table was taken apart for removal. 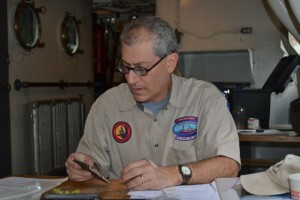 This was a table that was never on the lightship when in service. 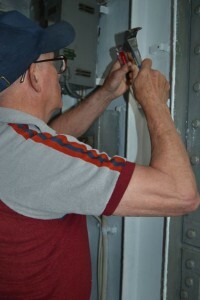 A gasket was cut for the top of the damage control locker to improve its waterproofness. The emergency and exit light fixtures were tested. A rehabilitated screen for one of the skylights was returned. More work needs to be done on the skylight before it can be put back in place. Greg working on electrical component. Hobie removing a tap that broke off when cleaning threads from light bracket. Tony painting electrical bracket in Fidley. Greg and Hobie work on electrical penal. 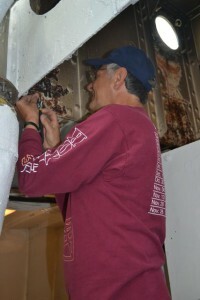 Tony chases the threads for electrical brackets in Fidley.